The Moon will appear slightly larger on Monday, November 14th in a phenomenon appropriately called a “supermoon”. The last time a supermoon as large as Monday’s happened was in 1948. If you miss this opportunity, you’ll have to wait 18 years to witness the Moon’s exceptionally grandeur appearance. A supermoon results from the combination of two astronomical events: a full moon and a perigee. A Full Moon generally occurs once per month. The Moon and the Earth’s orbit are tidally locked, meaning we only see one side of the Moon from Earth, regardless of our position on the planet. When the Moon and the Sun oppositely align in the sky, the Moon’s surface fully illuminates. Like every month, we will once more see a Full Moon on Monday. 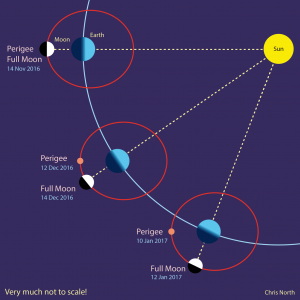 The Moon’s perigee also occurs once per month. The perigee is the Moon’s closest approach to Earth. The Moon orbits the Earth in an ellipse or oval shape. This results in a varying distance between the two objects, depending on the Moon’s position during its orbit. When closest, the Moon is approximately 360,000km away, while measuring 405,000km away at its furthest location. As the Moon nears the Earth, it appears larger in the sky. It is called a supermoon because the perigee and the full moon happen at nearly the same time. 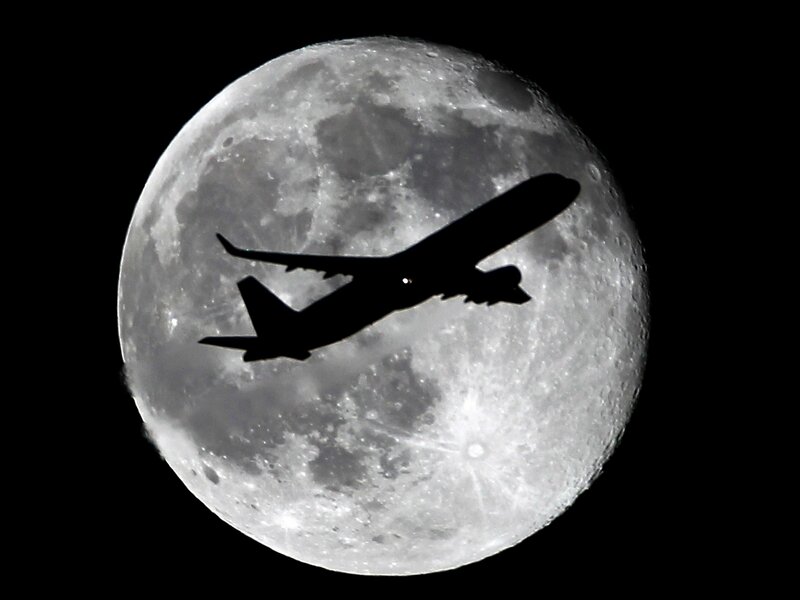 The Moon will reach its closest approach to Earth- perigee- at 6:30pm ET during the evening of November 13th. Hours later, the Earth, Sun, and Moon will align almost perfectly at 8:30am ET on November 14th; the Sun and Moon will be directly opposite each other. Although both the Full Moon and the perigee occur once a month, the events typically are out-of-sync. Due to the Earth orbiting the Sun, the moon’s perigee takes years to reach both the closest point to earth while also aligning oppositely to the Sun. This emphasizes the rarity of the of this month’s supermoon. Don’t feel discouraged if unable to see an evident difference in the size and brightness of the Moon. Even though 16 percent brighter and 15 percent bigger, unless the moon is close to the horizon, most astronomers will not notice a difference in appearance. The closer an object is the horizon, the larger it seems. This results from the ability to compare the moon to surrounding objects near the horizon. The noticeable effect to everyone living near the ocean is slightly larger tides. As the Moon and Earth are tidally locked, the closer the Moon is to the Earth, the greater pull its gravity has on the tides. The last comparable supermoon was in 1948, and one of a similar magnitude won’t happen again until 2034. So, take this opportunity to witness the unusually big and bright moon this Sunday night into Monday morning! Editors Note: I issue a personal apology for not posting since October. As a senior in high school, my academics needed to take priority. Thank you for your patience, and I look forward to returning to regular posting. Astronomy, full moon, moon, perigee, supermoon. Bookmark.